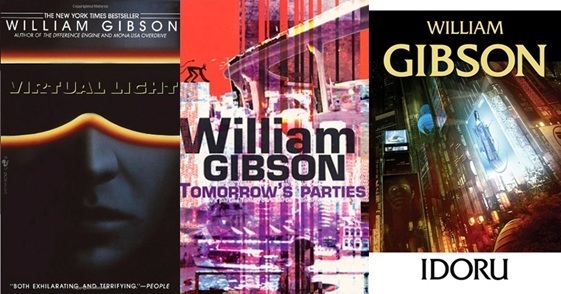 The Bridge trilogy is the second trilogy of science fiction novels by William Gibson (better known for his Sprawl Trilogy), set 20 Minutes into the Future. To be exact, it takes place in 2006, so it's obviously fallen victim to Science Marches On, but the books are nowhere near irrelevent. When one projects them another twenty or fifty years into the future, it's quite easy to believe in the world in which they are set. The Bridge trilogy is set primarily in the cities of San Francisco and Tokyo after a major earthquake that caused the Oakland Bay Bridge to be abandoned and then rebuilt as a shantytown of sorts. Tokyo, on the other hand, was rebuilt using nanotechnology and is, in many ways, more impressive than it was before the quake. The Bridge, from which the trilogy takes its name, is an important location in the first and third books, but not mentioned in the second. The books in the Bridge trilogy are, in order, Virtual Light (1993), Idoru (1996), and All Tomorrow's Parties (1999). Cyber Punk: Or Post-Cyberpunk, depending on who you ask. Shoot the Messenger: Chevette Washington, a bicycle messenger, mentions this trope frequently. She's never shot, but she clarifies that the basic idea — blaming a messenger for her message — is true. The Great Politics Mess-Up: The Soviet Union collapsed, but the U.S. hasn't fared much better, either - as with Neuromancer, the Cold War went white-hot and then faded in a nuclear haze, but not before giving birth to the rise of the technology in Gibson's novels. 20 Minutes into the Future: The trilogy, written in the 1990s, is set in 2006, after a massive earthquake has resulted in the abandonment of the Oakland Bay Bridge, which has since been resettled as a sort of squatters' shantytown.